In her opening address at the United Nations General Assembly on Wednesday, Brazilian President Dilma Rousseff said the 6th BRICS Summit hosted by Brazil in July this year “pointed to important perspectives for the future”. “We have signed agreements on the establishment of the New Development Bank and the Contingent Reserve Arrangement. The Bank will help meet the infrastructure financing needs of the BRICS and those of other developing countries. The Contingent Reserve Arrangement will protect countries from financial volatility. Each instrument will have a capital injection of US$ 100 billion,” she noted. 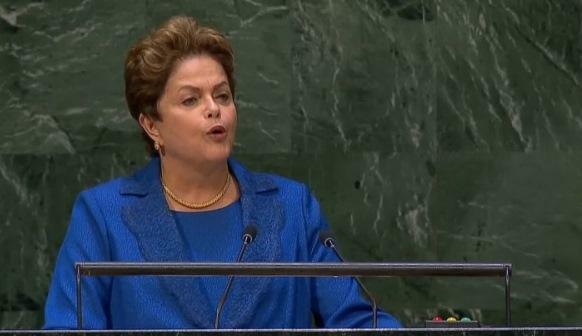 Rousseff has slammed the delay in implementing reforms at the UNSC, the body tasked with keeping international peace. “The Security Council has been having difficulties in promoting peaceful solutions to those conflicts. A genuine reform of the Security Council is necessary to overcome the current paralysis. This process has been dragging on for too long,” she said. “I am certain we all understand the serious risks of paralysis and inaction at the Security Council,” she added. BRICS members, India and Brazil have both bid for permanent membership of the UNSC. Rousseff also warned that international financial institutions are in danger of losing legitimacy if developing countries are not given proper representation. “It is also imperative to eliminate the disparity between the growing importance of developing countries in the global economy and their insufficient representation and participation in the decision-making processes of international financial institutions, such as the Monetary Fund and the World Bank. The delay in the expansion of voting rights of developing countries in these institutions is unacceptable,” Rousseff said. “These institutions are in danger of losing legitimacy and efficiency,” she added. Even as the US launched a new round of airstrikes in Syria, Rousseff also criticized the use of military force in Middle Eastern countries and also in Ukraine. “Each military intervention leads not to peace, but to the deterioration of these conflicts,” she added. A third night of US-led air strikes late on Wednesday targeted Islamic State-controlled oil refineries in eastern Syria.